I'm kind of shocked to find this priced highly! I'd expect this to at least be less than $15 CA at the median! I got to thank my Memaw for passing this record down to me for free! I got this today. I don't know why there stands "Unknown". It's from 2009 an official Kling Klang release printed in the EU. UK or Germany I guess because It-'s Kling Klang /Parlophone. The only difference. I put it on just to see if all is okay. Not have it sealed and when you open it it's a misprint or it's wavy, etc. Always check the vinyls! Better to buy an checked open one than a damaged sealed one. Back to the album When I put it on a lousy stereo it was very good. Quiet, good pressing, good sound. They made it real nice with a 12page book with cool printings and the inner sleeve is also massive and coloured. Can anybody understand that? They make a real good 180 gram pressing but put it in a thick paper sleeve without a plastic in.. I put such vinyls in a inner sleeve plastic sheet. It's real god and well made. Glad that that was the one I hadn't. The others are regular ones but sound also good. For their age anyway. 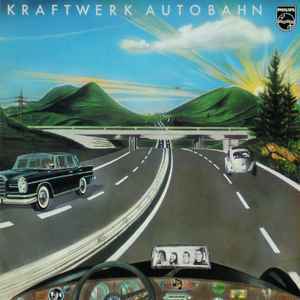 Trying to locate a version that appears similar to this version: https://www.discogs.com/Kraftwerk-Autobahn/release/4062704 in the database. "Autobahn" is banded, however it does NOT have the "Promotion Copy. Not For Sale" printed on the label. Mine is a clear cassette rather than white. Would that change anything about this release? Found my copy in a free left over flea market bin that was given to my father (can you believe that?) 1974 vel-2003 pressing with a split sleeve. As old as it is and how badly it was treated it sounds pretty clean. Amazing grooves that bridge the gap of the Kraftwerk 'psychedelic jam out' sound with the new wave electronic cleanliness. Many great jams on this copy that aren't just the generic AutoBahn track that I was familiar with. Great excursions! I've got one with side 1 "VEL-2003-A-CS5" and side 2 "VEL-2003-B-CS6"
Sounds much better than one would expect for an album of this format and vintage. The eponym track "Autobahn", a genuine turning point in modern music, is the symbol of "motorik". It is defined by the use of a hypnotic and slow-paced beat combined with bleak sounds, whose goal is to imitate the experience of a repetive driving experience on highway. Autobahn is not a completely electronic album since instruments like violin, flute, piano and guitar are used along with synthesizers. Its success is justified there, both musically and historically. A reference to own.